Akwidaa is 1½ hours drive from Takoradi and 45 minutes from the smaller Agona. You can either go by private taxi or grab a tro-tro from Agona tro-tro station. Taxi is less cumbersome, but naturally more expensive (in the area of 60 GHS from Agona). In either case, you are in for a bumpy ride since most of the way will be on a gravel/dirt road that half washes away during the rainy season. Here are a few 360° images that will give you an idea of the everyday setting in Akwidaa. The beachfront lodges are not located directly in the village centre, but with walking distance to the centre. A river separates Akwidaa in two, Old Town and New Town. On either side of the river, there are coastlines with beaches. Not surprisingly, the further away you are from the town centre, the more quiet it gets. Along with exploring village life, we recommend taking a mangrove trip. Look for your local guide Ben, who has a little tour shop near the river in the New Town part of Akwidaa. He will take you on a charming wooden canoe trip along the mangroves and optionally show you an old fort. Another great adventure is to go mountainbiking in the area with Isee (as in “I Sea”) – ask in town, and you will find him. For surfers coming to Akwidaa, bring your own boards. There are good spots on either side of Akwidaa. If you fancy staying overnight in Akwidaa, we recommend Ezile Bay Ecolodge. The best thing about Ezile Bay Ecolodge is that it has its very own bay. It is very picturesque with large almond and palm trees providing shade, and the village in the background. 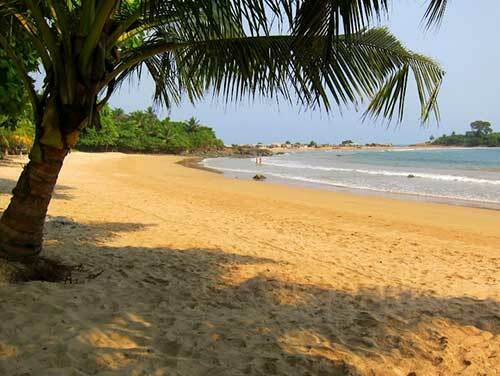 This is a perfect beach to chill at, and it is within a few minutes walk from the colourful Akwidaa town. The bay is rather protected, so swimming is usually safe here. The rooms and facilities are simple but comfortable. For budget travelers, there is a small dorm and it is possible to pitch your own tent. If you are looking for aircon, TVs, and hot water you came to the wrong place. The lodge has its own French-Ghanaian restaurant.